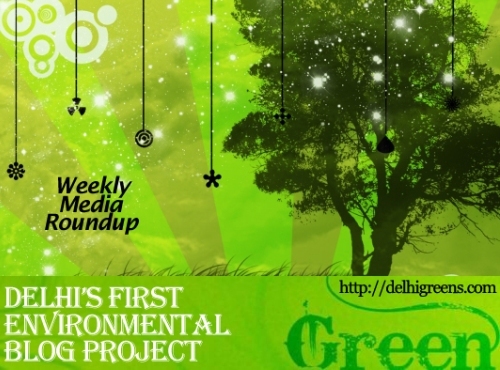 Weekly environmental news roundup from across different media networks for week 33 (starting August 13, 2012) 2012. Till some years back, the house sparrow was the quintessential ‘chidiya’, the most common image to come to mind when one discussed birds in Delhi’s urban context. One day it dawned on the city that the little feathery creature has more or less vanished, its absence even more pronounced by the sudden over-population of pigeons. The forest department of Delhi has written to the state governments to make the city an elephant-free area. There are 18 registered elephants in the capital, which the department claims are a traffic hazard and pose as a safety risk. Letters have been sent to Rajasthan and Uttar Pradesh, asking if the elephants could be taken by these states for use in tourism. Delhi Chief Secretary P. K. Tripathi on Saturday inaugurated a new greenery drive by undertaking ceremonial plantation of saplings at Garhi Mandu near Wazirabad Signature Bridge. Besides Mr. Tripathi, more than 200 school children also planted saplings. Murmur against Delhi Jal Board’s proposed public-private partnership for 24×7 water supply projects is growing stronger. The city might be looking at a hike in parking rates soon and change in parking policies as stakeholders have agreed, in principle, that such solutions need to be found for Delhi’s parking problem. Should tourism be allowed a free run in forests that are breeding grounds of tigers? A curious case in the Supreme Court to restrict flourishing tourism in the core of tiger reserves has got many agitated. The Delhi-based Centre for Science and Environment says conditions placed by the US as part of its climate fast-start finance initiative is killing the Indian solar panel industry. Bacterial contamination in the Ganges has exceeded the maximum permissible limit at a number of locations even as 80 per cent of pollution in the river is due to discharge of sewage, the government said today. Rajasthan’s environment and forests minister Bina Kak has written to National Advisory Council chairperson Sonia Gandhi asking that the Union government advocate the case for continuing tourism in tiger breeding areas in the ongoing litigation in Supreme Court. Government has taken several steps, including establishment of protected areas, to conserve the rich bio-diversity of Western Ghats, environment minister Jayanthi Natarajan has said.